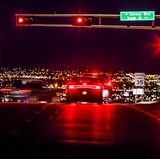 University of New Mexico researchers have been awarded a five-year $7 million federal grant that establishes a new center to develop more effective behavioral health interventions for the state’s under-resourced, racially, ethnically and geographically diverse communities. 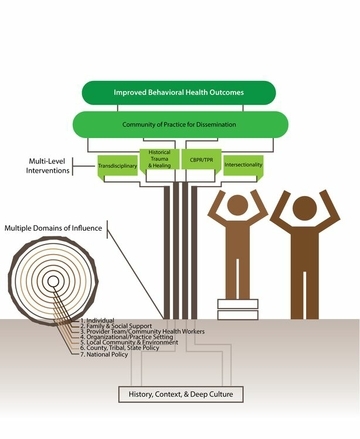 Conceptual model for the Transdisciplinary Research, Equity and Engagement Center for Advancing Behavioral Health, or TREE Center. The Transdisciplinary Research, Equity and Engagement Center for Advancing Behavioral Health (TREE Center) will bring together researchers in multiple disciplines from across the university, said Lisa Cacari Stone, PhD, an associate professor in the UNM College of Population Health who will direct the new center. “The center strives to partner with communities in order to conduct solutions-focused research with, rather than on them,” Cacari Stone says. While the two initial research projects will focus on Native American and immigrant Latino populations in the Southwest, future projects will include other populations. 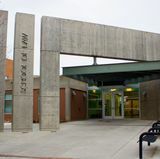 Funding for the center was awarded by the National Institute on Minority Health and Health Disparities, a branch of the National Institutes of Health (NIH). UNM was one of only 15 institutions selected out of 110 applications for grant funding submitted to the NIH. “We became a competitive force both because of the trans-disciplinary scholarship we have here and our community and stakeholder commitment,” Cacari Stone says. The research team will study how social determinants, including historical trauma, adverse childhood experiences and the combined effects of poverty and discrimination, affect behavioral health, Cacari Stone says. In a state where Native American youth are at high risk for suicide and immigrants may be dissuaded from seeking mental health care because of fears of deportation, the aim is to develop and evaluate sophisticated and culturally competent behavioral health interventions that operate in multiple dimensions, Cacari Stone says. If the research is successful, it will make a measurable impact in preventing or reducing youth suicide, alcohol and drug misuse, and depression in vulnerable populations, while improving access to behavioral health services. It also will provide an opportunity to grow a diverse scientific workforce through training new investigators and building leadership capacity from under-represented minorities, she says. Cacari Stone is one of four principal investigators on the grant. The others are Steven Verney, associate professor in the Department of Psychology, Maria Yellow Horse Brave Heart, associate professor in the Department of Psychiatry & Behavioral Sciences and Gabriel Sanchez, professor in the Department of Political Science and executive director of the RWJF Center for Health Policy. 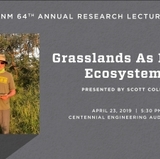 Other team members are drawn from UNM’s Colleges of Education and Pharmacy, the Office of Community Health and the Departments of Sociology, Internal Medicine and Pediatrics.